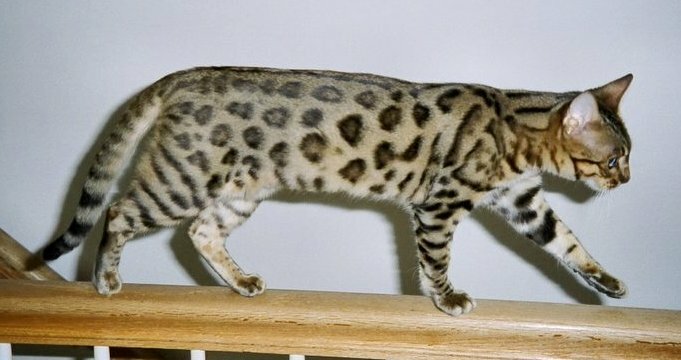 The Bengal cat breed is a perfect example of man’s need to breed a domestic cat that has the look of a wild jungle cat. In the 1960's, there was an accidental mating between and Asian Leopard Cat and a black, shorthaired domestic cat at Jean Sugden's home in California. She made no further attempt to develop this hybrid cat breed until the early 1970's when she (now Jean Mill) received more such hybrids from Dr Willard Centerwall at the University of California. These cats were part of a research project aimed at determining if the Leopard Cat's immunity to feline leukaemia could be transfered to domestic cats. Unfortunately results were negative. 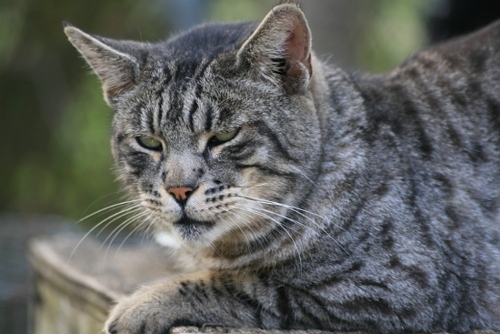 This wThis was the first effort to create a cat breed with the temperament of the house cat and the look of a jungle cat. The Bengal cat breed of today can be traced back to cats bred by Jean S. Mill in the early 1980’s. In 1986 TICA accepted the Bengal as a new breed and in 1991 this cat breed received championship status in 1991. The modern domestic Bengal cat comes only from breeding Bengals to other Bengal cats. 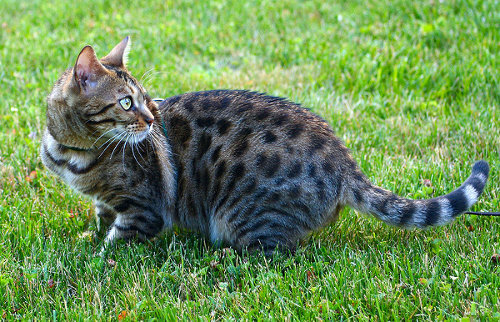 Originally there was just a spotted coat type, but over time variations appeared and different associations have different standards for the Bengal cat breed. The Bengal cat is a medium to large sized cat with a magnificently colored coat that has vivid spots or distinctive marbling. A feature called glitter is found in some Bengal’s coats and it is this feature that gives the iridescent sheen to each hair. The spots on the Bengal’s coat can be small or large and often have a two-toned look. A swirling pattern that appears as random swirls or flowing horizontal lines is referred to as the marble pattern. The most popular coat color is brown or black tabby, which can be anything from shades of golden, copper, bronze, gray or mahogany with spots or marbling. Spots and marbling can be intense black or rich brown. Snow Bengals have a recessive pointed gene that result in blue eyes and a cream base coat with a pearly shimmer. Silver Bengals have a coat with a white or gray background with dark gray to black patterns. Bengal males are generally larger than the females and weight ranges from 6-15 pounds. The Bengal cat breed is well muscled and has an athletic look. A clear understanding is needed of what exactly is meant by a Bengal. 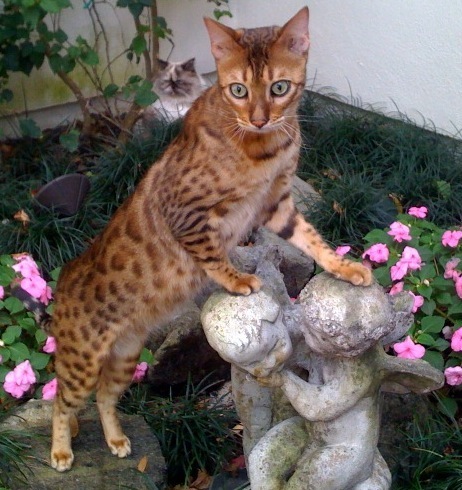 The Bengal name can only really be applied to F4 hybrids - cats that are four generations down from the wild cross. Cats from earlier generations (foundation cats) are much closer to their wild ancestors and find domestic life very difficult. They are ofthen nervous and do not integrate well into famliy life with people and other pets. F4 Bengals tend to be inquisitive, confident and active cats that can be found high up on a perch, generally looking for something to do. They are affectionate and devoted and get along well with other pets when properly integrated. The Bengal cat breed needs lots of playtime that involves running, chasing, climbing and jumping. Bengals like to play in water and will even try to join you in the bath. Some use their voices to talk to you whilst others are quiet cats. Do not expect a docile lDo not expect a docile lap cat when you get a Bengal. This cat is all about action and fun. Should you consider a cat breed like the Bengal, first find out as much as you can from a registered breeder. The Bengal cat breed is very prone to Irritable Bowel Syndrome, most likely due to their wild heritage. The cereal content in commercial cat foods can aggravate this condition and you will have to spend the time and the money to find the right food for your Bengal. You will have to boil drinking water for a Bengal cat as they are also susceptible to micro-organisms found in unchlorinated water. 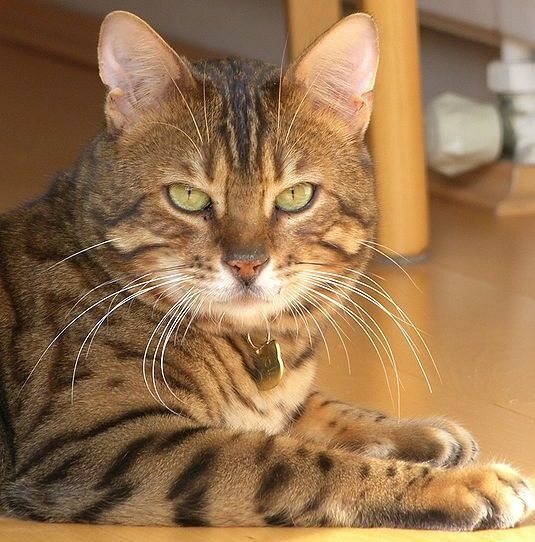 Do you have a story about Bengal cats? Cat Breed Info is all about cats and people like you who love cats. That's why we would like to hear your stories - whether its about your princely Persian, your sultry Siamese or your mischievious Moggy, we want to hear it and we want to see the pictures!